The back of this Barbie Styling Head says 1971 Mattel Inc. Mexico. She also has a string with a ring on the end on the back of her head to allow her hair to "grow." I remember purchasing her from a neighbor friend at her yardsale when I was a child. I have been unable to find anything like her in my searches online. I am not familiar with this one - let's put it up and see if anyone else has any info. That is a growing hair 1971 Barbie Beauty Center. You pull the string to make her ponytail grow. My sister had one of these when we were growing up. I doubt it survived our many moves, but they were sold in the US some time around the early 70's. I still have one of these still in woking order. Itook it out of its box and gave it to my daughter. I have a styling head that also has an arm attached. I think its a Barbie but really not sure. Could it be a vintage model-as I can't find anything similar at all. Any information would be helpful. Thanks. 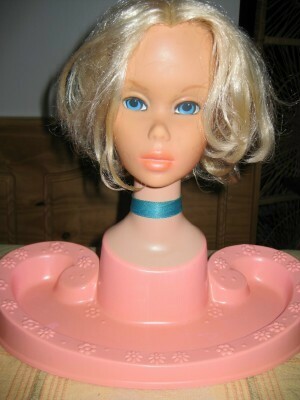 I have the same exact Barbie Beauty head and the box from when I was a little girl. The box is marked 1972. Do you know the value or how to find out what it's worth? I had one of those too! I liked doing her makeup more than her hair though. It is the Barbie Beauty Center. It came with eye shadow, blush, lipstick, eyelashes, eyebrow/liner pencil. You could apply the make up and wash it off. It also came with rollers, barrettes, bobby pins, & ribbons and brush & comb. Her hair did "grow" by pulling on the ponytail or it could be shortened by pulling the ring at the back of the head. I still have mine in the original box with all the accessories including the instruction book that is dated 1972. I also had one of these in the early 70s. I gave it to my daughter a couple of years ago It was still in box fairly good condition. would be interesting to know how much it is worth. I had one and my cousin. She learned me how to braid hair on it. I would like to purchase one for my little niece.